Sometimes extra produce seems to materialize overnight and rather than going through the time consuming process of canning, it might be easier to make some tasty refrigerator pickles. This works really well for a quick relish tray, or simply an unusual sandwich garnish. Pickles have been popular around the world for several thousand years and just about every culture has some form of pickled fruit or vegetable they can lay claim to. Pickling preserves otherwise perishable fruits and vegetables in a brine or fermented state and the resulting product remains edible for months, or even years. We're not going to be pickling by a traditional fermentation method though, we're simply going to be using brine, sugar, vinegar and spices to quickly preserve some extra produce in a tasty manner. I had some cucumbers languishing in the refrigerator and when I harvested a slightly over-mature yellow squash, it seemed the perfect time to make up a batch of easy and tasty pickles. There was about a half-gallon of cucumbers and with the squash and some other veggies that I had on hand, I had the makings for a great combination. Just about any vegetable is a potential pickle, so whatever you have on hand will probably work with this method. I had the cucumbers, the over-mature squash, a couple bell peppers, an onion, carrots and some hot peppers, plenty for a batch of refrigerator pickles. I washed all of my produce and used my mandolin to slice them thinly. After everything was sliced, I sprinkled a half cup of canning and pickling salt over the whole thing and covered it with ice. The salt is a desiccant that pulls moisture from the vegetables, while the ice keeps everything fresh. It is important to use a non-iodized salt (kosher is fine) because the iodine turns your pickles an unsightly shade of gray and leaves a sediment in the bottom of the container. It isn't harmful, but it doesn't look very appetizing. Let your vegetables sit at room temperature until the ice is melted. This usually takes several hours. When you're ready to make your pickles, drain the vegetables in a colander. Some folks rinse their veggies, but I've never felt the need, there isn't much salt left once everything is drained. 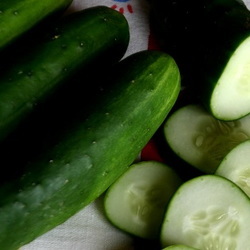 While the vegetables are draining, prepare your pickling solution. I used four cups of white vinegar, one cup of brown sugar, two cups of white sugar, three tablespoons of mustard seed, some celery seed, dill seed and a healthy sprinkle of ground allspice. I also had a small container of ground horseradish in the refrigerator, so I added several heaping teaspoons of that as well. I always use mustard seed, but the other spices are generally determined by what I have on hand at the time, so be creative. Bring this solution to a boil in a large container. When your liquid has come to a boil add your vegetables. I keep them over a medium-high heat until the solution just comes back to a boil again. This means everything is heated through. At this point your pickles are done. I ladled them up into a container and as soon as they had cooled some, I put them in the refrigerator. The flavor is best if you wait about a week before eating them, but they're already quite tasty after a day or two. I especially like them added to sandwiches. They'll keep almost forever, but chances are, they won't last long at all. If you wish to can your pickles, that's easy too. Have your pint jars washed and sterilized and waiting hot. I keep mine in the sink with scalding hot water over them. You'll also need new canning lids and clean rings that don't have any rust on them. (you can use your rings over and over again, the flat lids have to be replaced each time you use them) Put your lids in a small saucepan and cover them with water. Simmer on the stove until ready to use. They need to be hot as well. Fill your jars with the pickles and make sure that the liquid comes within 1/4 inch of the mouth. I generally make sure my pickles are loaded and then go back and top off the liquid, giving each jar a bit of a shake to dislodge air bubbles. Clean the rim of the jar with a paper towel, place the lid on and screw the band down snug. To seal the jars, (if you don't have a specialized water bath canner, no worries. Here's how to do small batches without having to purchase one. Place a tea towel in the bottom of a stockpot before you add your jars of pickles and add enough hot water to cover the jars. When the water comes to a boil, process 5 minutes. 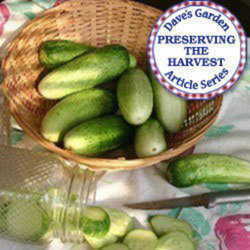 Lift your jars of pickles from the water and sit them on another towel on the counter. You should hear the seals 'pop' over the next hour. That means they will keep without refrigeration and you can share them with your friends and family as gifts! The image at the top of the page shows off some that I canned to give away. 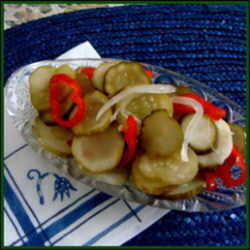 These pickles are easy and a great way to add some variety to your menu. Any extra produce is fair game; think outside the box with green beans, okra, corn or scallions. Make up a batch and share with family and friends...they're sure to be impressed!